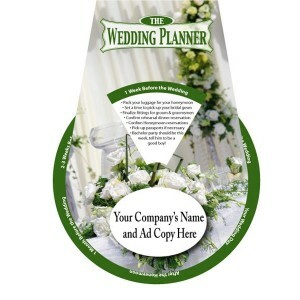 re you a wedding vendor looking for an item that brides will use over and over with your logo front and center. A wedding planning wheel will be used by brides time and again from their engagement through the big day and after the honeymoon. 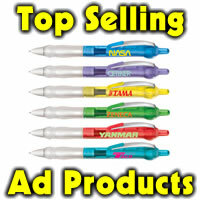 Great for wedding showcases, bridal shows, hair salons, nail salons, spas and more. It contains useful planning tips for time periods 12-16 months before the wedding, 2, 4, 6 and 8 months before, and on the reverse side, the month, weeks and day of the wedding. Extremely useful, large imprint area for the vendor. Great for bridal shops, wedding and reception venues, florists, cake decorators, wineries and more. Any bridal business could use these handy wheels as a marketing piece. Minimum is 250 pieces, 1.30 ea. for 250-499, 1.15 cents for 500-999, 1.05 ea for 1000-2499, 99 cents for 2500-4999 and 95 cents at 5K or more. Set up is 35.00. 3 week in factory production after art is approved so order early.